Sukkhe means "dry" and is one of the most popular ways of preparing vegetables in South Canara (South Mangalore). This vegetable dish contains a good sprinkling of grated coconut which gives the dish its flavour and texture. As every mangalore family has their own interpretation of a vegetable sukkhe this is my version. I remember having this fruit during my yearly visits to see grandma in our native place in Mangalore. When a big jackfruit would be opened, took ages to clean but finished in seconds. I do not recollect seeing this fruit very often in Bangalore, on occasion we would get a portion from our friendly mangalorean neighbour who had a jackfruit tree. The jackfruit in its tender green and raw form is used as a vegetable. It is considered to be a rarity and a delicacy. It is one of my hubbies favourite veges. We had been on the look out for it for ages and one fine day two years ago we found it in the canned form in our asian store . We were overjoyed. We brought it home, cooked it and fell in love with this wonderful vegetable. The best part was we did not have to undergo the pains of having to clean and cut the vegetable and the flesh was firm and had a lovely texture. 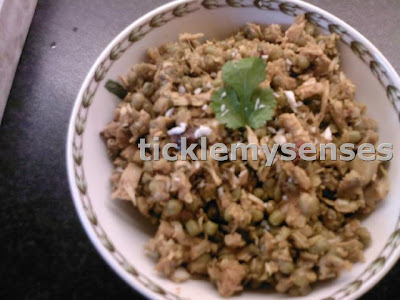 When sprouted the mung bean is a good source of Vitamin C.
This dish is low in fat, nutritionally healthy, having a is a good source proteins, vitamins and lots of fibre. 1. Soak the green gram in water for 24 hrs then tie in a muslin and allow to slightly sprout (make take 2 days). 3. In a pan take 3 tsps of oil, add mustard seeds, when it splutters add red chillies, finely chopped garlic, curry leaves and fry for a minute. 4. Add chopped onions fry till lightly brown. 5. Add finely chopped jackfruit , add red chilli paste, vegetable sukka powder, salt and fry on medium flame till jackfruit is cooked( may take 7-10mins). 6. Then add the cooked mung/ green gram , mix well. 7. Add fresh grated coconut, cook for a further 3 mins.Taste for seasoning sprinkle with chopped coriander leaves and serve hot. It is a good accompaniment to rotis or rice and dhal. We have it along with rice, saaru and fried fish. An alternative to tender jackfruit is tender bambooshoots. Can be made using above recipe.